If you follow me on Instagram, you may remember that last Saturday, at the Farmers’ Market, I got my hands on some amazing Concord grapes from the Finger Lakes District (NY). But before we proceed any further, let’s make things straight and clear: If you don’t like Concord grapes I’m afraid we can’t be friends. Sorry, it’s not negotiable. How can you not like Concord grapes? These things are a-mazing. They are tart, strong, and the taste is usually acquired; which is why kids love ‘em. To me, the taste of Concord grapes is an absolute flavor explosion and a true marvel of nature. → Brief historical digression. Do you know that when Concord grapes were first introduced in Europe in the 1800s; Italians, mesmerized by their sweetness, started calling them uva fragola; which translates literally as strawberry grapes. Cool, right? Btw, ever notice how everything sounds better in Italian? “Uva fragola” v “Concord grape”; I mean, come on! Concord grape is not only delicious it’s super-duper-healthy. The dark color of the fruit's skin contains plant-based phytonutrients with antioxidant properties. Concord grapes are rich in vitamins and minerals, whilst being low in fat. Research suggests that Concord grapes provide a host of benefits which may include lowering blood pressure, anti-inflammatory properties, boosting the immune system and protecting the DNA in our cells against mutations. But let’s move onto this sorbet. 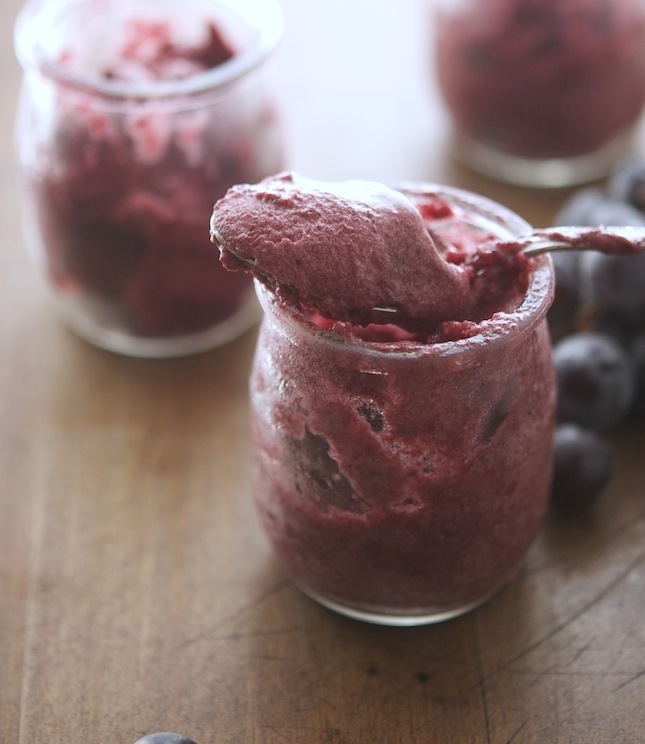 In my not-so-humble opinion sorbet is the best way to enjoy Concord grapes (other than eating them raw). That’s why every year I impatiently wait for the reappearance of concords at the farmers’ market. This is a sorbet that in its texture is as silky and smooth as ice-cream; except that there’s no cream, milk, eggs or sugar for that matters. The secret ingredient that turns this sorbet into THE BEST sorbet on the planet is egg white. Yes, all you need is one whipped egg white to make it happen in your kitchen, no need of an ice-cream machine. It's so refreshing and perfect for the end of a meal, and what about the color? So tempting even a fashionista would fall for it! 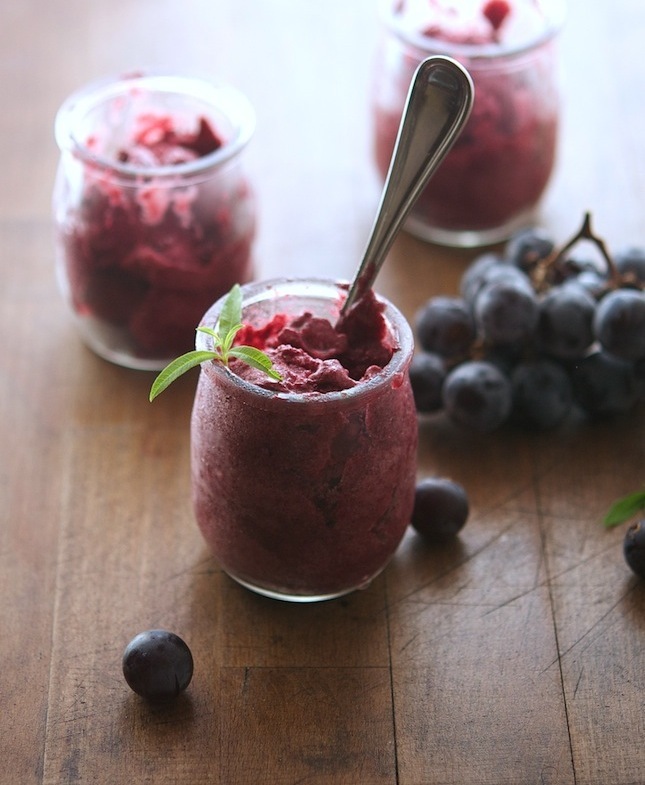 Concord Grape Sorbet Print this recipe! In the bowl of a food processor fitted with its steel blade, process Concord grapes and lemon juice about 2 to 3 minutes until pureed. Stir in the honey, cover and refrigerate for one hour. Just before you are ready to take the Concord grape mixture out of the fridge, in the bowl of an electric stand mixer (or in a glass bowl with an electric mixer) fitted with the whisk attachment, add egg white, salt and cream of tartar (if using). Starting on low beat the egg whites on medium speed until soft peak/trails begin to form, about 3 to 4 minutes. With the help of a spatula, gently fold whipped egg white into the Concord grape mixture. Don't stir. The purpose of folding is to retain the air you have beaten into the egg white. Be careful to only work the mixture enough to incorporate the white, and don’t use the electric mixer for this step. 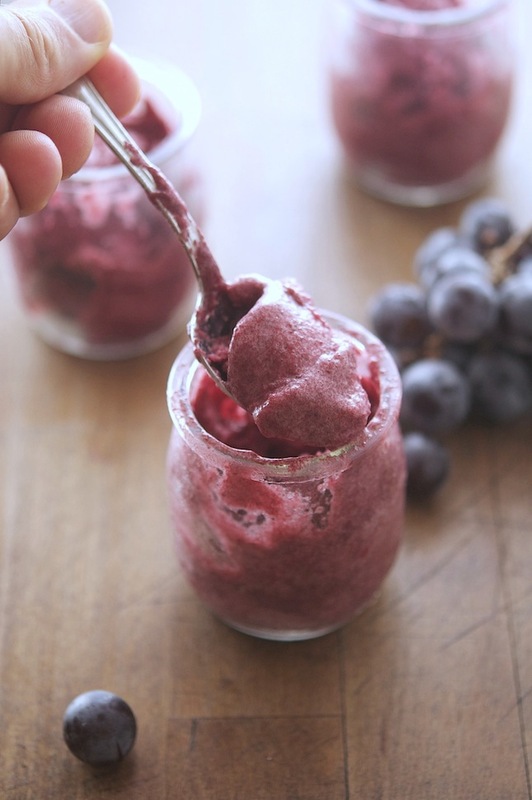 Transfer the Concord grape mixture into a freezer-proof container and place into the freezer for at least 2-4 hours (preferably overnight). If you own an ice-cream machine, by all means use it. 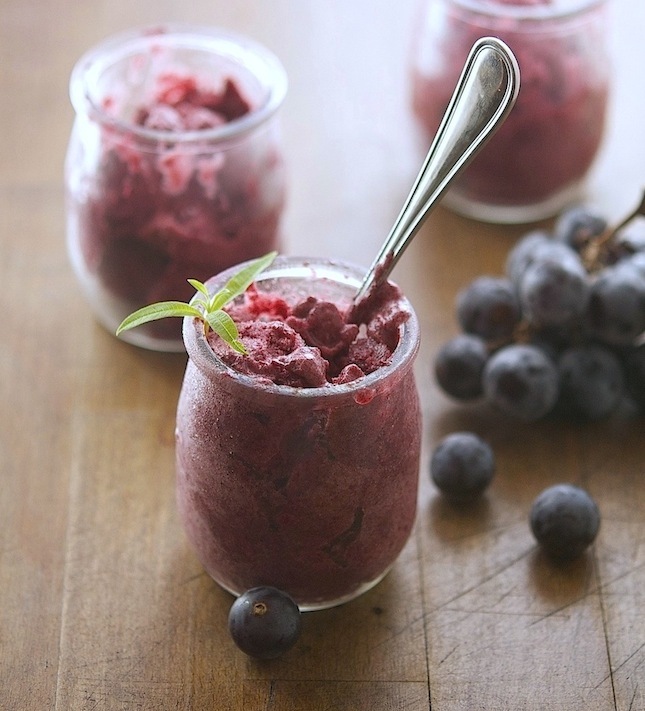 Take the sorbet out the freezer and transfer to the refrigerator 20 to 30 minutes before serving, to allow to soften. One serving yields 96 calories, 3.5 grams of fat, 23 grams of carbs and 1.75 grams of protein. I'm so bookmarking this recipe and as soon as my concords turn ripe I'm going to try this! Ooooh this looks so so good! I HAVE TO GET ME SOME OF THOSE GRAPES. NOW! Lovely grapes. Is honey a must need for this recipe or I can cut off this. About how much juice does this recipe make before anything is added to it? I'm asking, because I have fresh-pressed grape juice on hand --- so need to know how much juice to start with.